Stories by Conger Beasley, Jr.
Three stories of magic realism. Illustrated by Richard Schindler. This chapbook was #2 in the Wordcraft Speculative Writers Series. 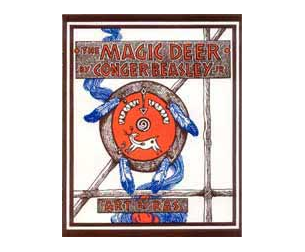 The Magic Deer [is] told with strong authorial voice, almost in the manner of oral storytelling....I was affected so strongly by the reading that I couldn't go to anything else when I was done; picking up another book seemed a letdown..."
These three stories show Beasley at the top of his form...at home with the mysterious, inexplicable and timeless." Conger Beasley Jr., has published two novels and three collections of short fiction. His most recent book is We Are a People in This World: The Lakota and the Massacre at Wounded Knee (University of Arkansas, 1995). In 1991 he was given the World Hunger Media Award for journalism for his three-part series, "Of Pollution and Poverty" (Buzzworm Magazine) and the Thorpe Menn Award for Literary Achievement for his book, Sundancers and River Demons: Essays on Landscape and Ritual (University of Arkansas, 1990).